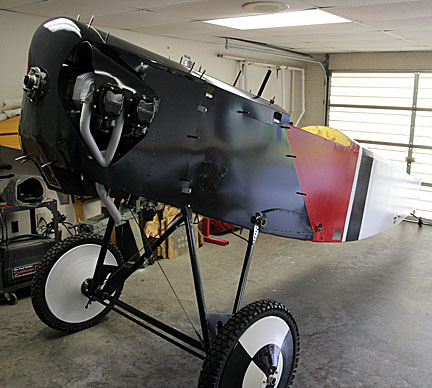 The last major phase of construction is painting the Fokker. 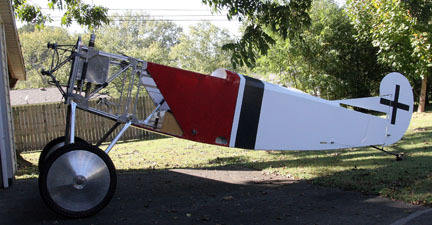 Many different methods have been used over the years for finishing experimental aircraft, usually some version of a certificated system. These certificated systems work well and are in common use but all are quite expensive. The dollars required are a good value for an aircraft with a retail value in excess of $35,000, but for much less expensive aircraft they can eat up a major percentage of total airframe cost. 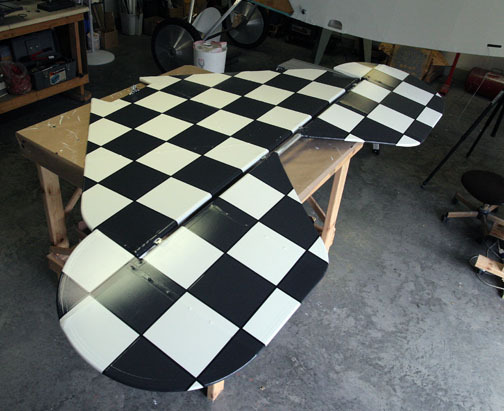 Can $3000 in fabric and finish be justified for an airframe that cost less than $15,000? For many builders the answer is "No" and this has prompted several alternate options. 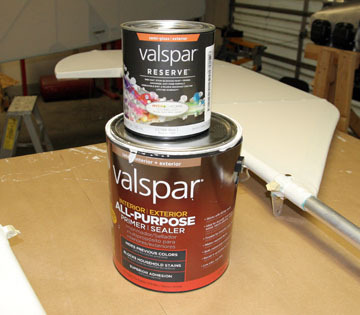 Some are better than others but one that has proven to be viable over the past 25 years is based on acrylic (formerly known as latex) house paint. I have used versions of the acrylic system on three previous projects and decided this was the best option for the Fokker. An excellent overview of the acrylic method can be found in this article. 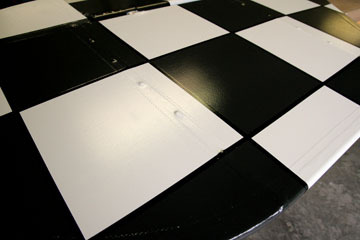 The fabric was attached to the airframe with Stewart Systems EkoBond as detailed earlier. 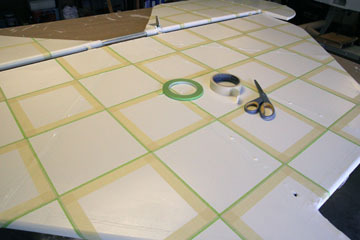 The first step in paint finish is to seal the fabric with an acrylic primer. 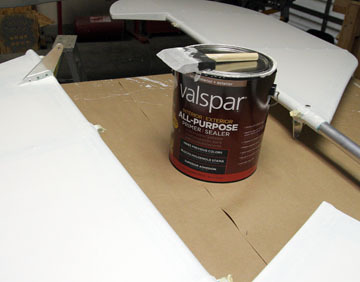 I selected a Valspar primer from the aviation aisle of the nearest Lowes. I don't think the particular brand of primer is critical, they all seem to be formulated for preparing various substrates for a topcoat of acrylic paint. The purpose of the primer is to form a mechanical bond with the fabric and prepare a suitable base for the topcoat. It also hides the fabric adhesive so topcoats will cover better. After going over all the tapes with a small iron one more time, I wiped down the fabric with acetone to remove any contaminates. The primer was applied with a foam brush with the first coat being very light to prevent primer from collecting under the fabric. Primer was forced into the fabric and brushed out with no visible brushmarks, no thinning of the primer was necessary. Two more coats were applied, each in a cross direction and this provided a nicely primed surface ready for top coats. The second and third coats were a little heavier than the first but still taking care to bed in the primer. The primer flows out as it dries and leaves a very consistent surface. The top coats will be Valspar Reserve Acrylic Semi-Gloss. They will be applied primarily with a 4" foam roller. 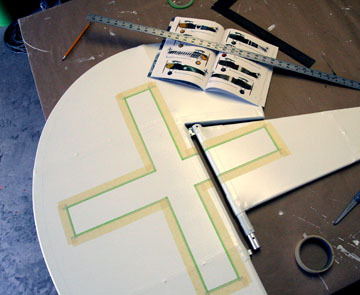 The plan is to paint the tail group and fuselage so the fuselage can be assembled for the final time. The wings will be the final phase of painting. 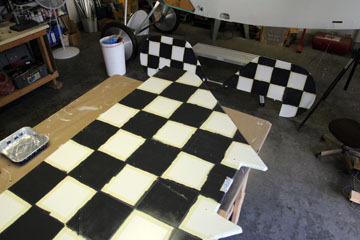 After the tail group and fuse received three coats of Ultra White, it was time to mask the horiz stab and elevators for a black checkerboard. The grid was laid out so the surfaces would be symmetrical and the checks on the elevators would be in alignment with those on the stab. A morning was spent with lay out and masking. Because the paint is rolled on instead of sprayed, it isn't necessary for a full mask, just enough to prevent rolling over into a white square. I used 1/4" fine line tape to lay out the grid and followed up with 3/4" masking tape in the white squares. First coat of black checks. Horiz stab and elevators are finished. The checks are 7.75" x 7.75" and received two coats of paint. The bottom surfaces have identical treatment. 1/4" black pinstripe tape was applied to all the edges. The painted surface is textured enough to prevent a sharp paint line but the tape covers the edges and gives a very finished look. Fokker D.VII Aces of WWI books. Fuse fabric and tail group is painted. Landing gear completion and paint comes next. I will get primer tinted red for the red areas of the wings. 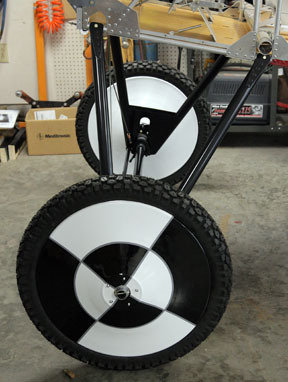 White primer is difficult to cover with red. A productive day painting metal parts. 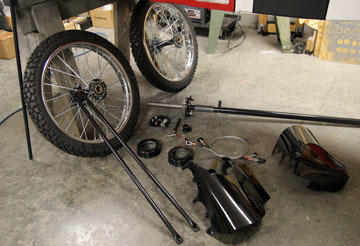 The parts received a scuffing with maroon ScotchBrite pads and then aerosol self-etching primer. Top coat was Valspar Armor polyurethane thinned with mineral spirits and shot with a gun. All landing gear parts are painted and ready for assembly and the engine eyebrows are ready for installation. The gear can go on the fuse for the final time then the engine will be hung for the final time. Landing gear painted and reinstalled on fuse. 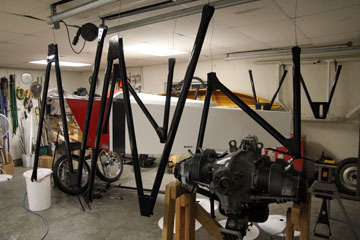 The D.VII had an airfoil on the landing gear. I am going to wait until after W/B is calculated to determine if there is enough margin to accommodate the weight of the airfoil. The sub-wing is purely to add to the cosmetic flavor of the aircraft and not needed aerodynamically. Cowl is painted. I still consider the cowl to be very much a prototype that will need to be proven during Phase 1. It is possible mods will be necessary so I didn't go to extensive measures to apply a top-notch paint job. I was also trying to outrun upcoming winter weather and complete the metal painting before it became impractical to paint outdoors. 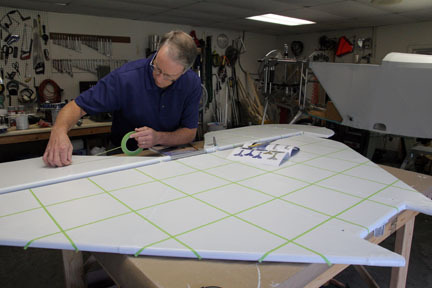 After flight tests are completed the cowl can be detailed (or replaced) for the long-term. My intention with the paint scheme was to make the wide engine as unobtrusive as possible. It does appear to blend into the lines of the aircraft fairly well. The nose bowl was very rough as delivered and required a lot of finish work to get it ready for paint. Stiffeners still need to be added to the inside of the bowl adjacent to the prop hub to prevent it from flexing in the prop blast, but that can be a winter task.